The ever popular Tool Bundle. It features our most popular kitchen items. Photo by Donna Turner Ruhlman. Then he gave me a pint deli of crosnes to serve at Thanksgiving and off I was. How incredibly gratifying that was. So, that intro aside, and in keeping with Cyber Monday, happily, we’re discounting all kitchen tools for this day. And always remember during this stress-filled season, it will all work out in the end. So don’t stress. Next year will come soon enough. Wishing you a peaceful and happy holiday. 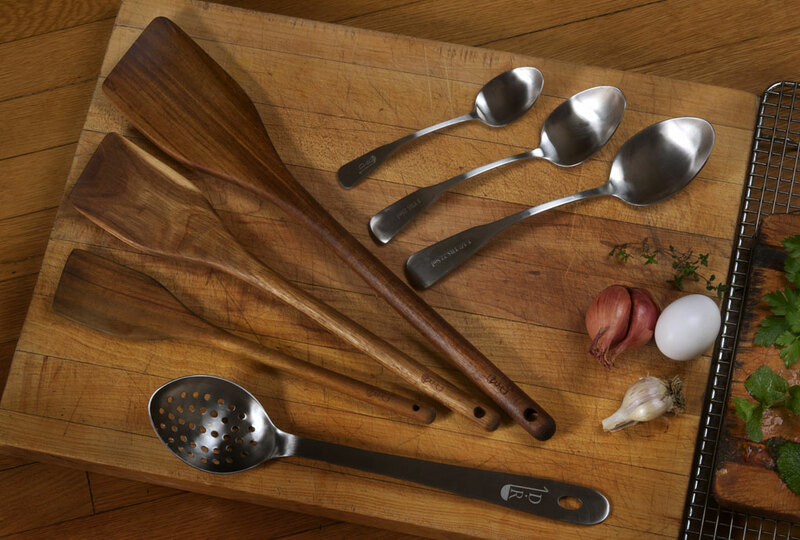 Tool Bundle — Features my go-to flat-edged wood spoons, invaluable. Egg Spoon — Badass egg spoon actually. A great all purpose perforated spoon, that also creates perfect poached eggs. Here’s the post and here’s Mac in the video. Offset serving spoon set —speaks for itself. Offer ends Saturday, December 3rd at 12am EST. © 2016 Michael Ruhlman. Photo © 2016 Donna Turner-Ruhlman. All rights reserved. I wanted to buy $15 worth of spoons but couldn’t get past the $17 shipping cost to California. You could probably really increase circulation via Amazon Prime shipping… hope better shipping options are available in the future! Yes, this has always been an issue. Very sorry about this. Thanks for commenting. Sadly I’m in exactly the same spot as Shannon. Bummer, I was really excited to add the medium offset spoons to the collection I have loved in the last couple of years. Michael why do you love the flat edged wooden spoons so much? I am really partial to a firm(ish) silicone spatula as my go-to tool for what I assume are the same collection of tasks, can you make a good case for me to switch? p.s. Ruhlman’s Twenty might be my favourite book (let alone cookbooks), I consider it a philosophical/spiritual text! spatula not strong enough to lift fond from the pan. though I love rubber spatch for so many other things. esp about the philo/spiritual remark. that was my hope, bec that’s what it is, so thanks. Same issue w/shipping costs almost as much as product! I love my offset spoons and was going to gift them for Xmas, but sadly, cannot. Maybe I shouldn’t ask but what did you do for the Thanksgiving Holiday? Did you cook? dear friends in nyc invited me to dinner. glad you had fun! I ordered the tool bundle and the tenderizer…I am in love. I have the day off today and am planning some kitchen adventures that will enable me to use every single tool! Many people I encounter (especially the one I look at in the mirror) are constantly on a soapbox about buying local and/or small. I always find myself complaining about big corporations ruining “the special”. I can walk into any big store and find exactly the same thing as I did in the other big store and at the big online retailers. Nothing special. Nothing that someone put time and thought in an effort to solve a problem. But there is free shipping. It is of the utmost importance, IMHO, to remember that smaller operations don’t have the same perks and economies of scale as larger ones. Sometimes, to get something special, we must pay for shipping. Thank you for thinking, and thank you for authoring the curriculum that I study as I continue to learn to think in the kitchen. You have empowered me, and brought me joy. Merry Christmas and Happy New year! Always check your excellent posts. How can I purchase your Poached Egg Spoon without paying high shipping costs? ( it’s not Free Trade, just “freer trade”! Love my spoons-got them when you first marketed them. I now gift them to relatives when they expect me to cook….